WEST NEWBURY, MA — As the weather gets colder, residents need to make sure chestnuts and not chimneys will be roasting on their open fire, according to fire officials. A flaw in a home's chimney was likely the culprit in a fire that scorched a Bailey's Lane house early yesterday morning, said fire Chief Rock Dower, adding that but the fire did not severely damage the house. Residents woke up about 2:30 a.m. to a smoke detector going off and found a cloth burning above their fireplace and mantel, Dower said. The family put the cloth out with a fire extinguisher, Dower said, but then noticed the wall above the mantel appeared to be glowing. They left the house and called the Fire Department, which stopped the blaze from spreading farther through the wall and ceiling. "Everything went well," Dower said. "They do have a house to come back to." Dower praised the family for maintaining their smoke alarms and said that while the fire was still being investigated, a flaw in the chimney was probably the cause. However, the fire serves as an early reminder that the potential for chimney fires could rise this winter as more people turn to wood and pellet stoves for heat due to the rise in energy costs. Jennifer Mieth, a spokeswoman for the state Fire Marshal's office, said homeowners should have their chimneys professionally checked every year to prevent fires. According to the Fire Marshal's office, in 2007 there were 880 fires statewide linked to solid-fueled stoves, fireplaces and chimneys. "A lot of people turning to wood fires haven't done so in a long time," Mieth said. "If you haven't used your fireplace in a long time, it's really important to check it out to avoid problems." Creosote, a flammable byproduct of burning wood, coats the inside of chimneys and makes them fire hazards, said Jeff Wright, the owner of Chimney Savers. Wright's company sweeps and maintains chimneys throughout the state, and he said chimney’s used for wood burning should be cleaned every year or after every cord of wood burned, whichever comes first. When creosote burns, it can crack clay liners in more modern chimneys and just heat up the bricks and mortar of older chimneys that are "not even close to current standards," Wright said. That heat is easily transferred to combustibles in surrounding walls. 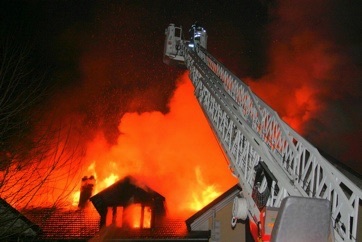 Wright said a loud whistling noise from the fireplace chimney usually indicates a fire. If that occurs, he said residents should attempt to close the chimney's throat damper and call the Fire Department. Fires are not the only danger from an improperly maintained chimney, though — blocked chimneys can cause carbon monoxide poisoning. And the pipes from a house's furnace are always in use, Wright said, and need to be inspected as well. But chimney inspections, especially of older flues, are easier, he said. "Most of the time, we recommend a level 2 / video inspection," Wright said. "But sometimes we don't even need to because the problem is pretty obvious."